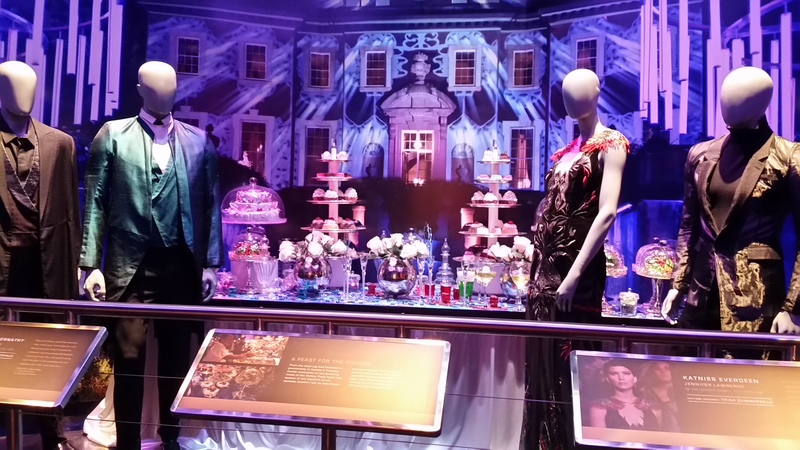 Welcome, welcome to our review of The Hunger Games Exhibition! A few lucky fansites were given an early preview of this massive undertaking over the weekend! Kait and JJ attended the event (though JJ very skillfully avoided all the cameras). Now, we’re breaking down everything you need to know if you’re considering a visit to what seems like the franchise’s very first East Coast attraction! Yes, all the major costumes and set pieces are there, perfectly positioned and lit in all their glory. You’ll be tons of familiar outfits, designs, and set arrangements. You’ll also see so things you didn’t notice in the films. 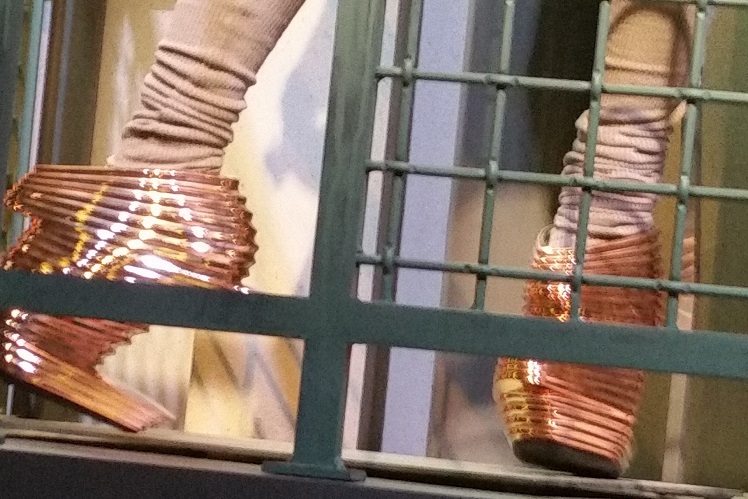 For instance, did you know Effie was wearing these shoes in District 13?! We’ve never seen them before and it’s tragic! The costumes are spectacular, but there’s also full set pieces to adore. They’re set up in ways you’d easily recognize the film and pretty dazzling up close. For example, the Hob set in full of props that look faded and distressed, but seeing it all in person adds a whole new dimension to it. As you end with one section and walk into another, you’re usually turning a corner to find a massive, beloved scene RIGHT IN YOUR FACE. It was enough to make us squeal, even enough to make some others get all teary-eyed! Also, Josh, Jen, Willow, Jena, and Francis went through the exhibit yesterday, the day after the fansites. They touched what we touched. WE PRACTICALLY EXCHANGED FRIENDSHIP BRACELETS. Just kidding, but it’s still pretty awesome! When you enter the exhibition, you’ll be given a handy cell phone sized device. It seems like it’s just an audio guide, but there’s lots to do with it! Namely, it finds “Hidden Spots” throughout the exhibit that unlock deleted scenes and show how the props in front of you. They also pull up holographic maps, allow you to take pictures, and give you a special ally with whom you can explore! Every here and there, you’ll find polling stations that ask how you would react in certain Hunger Games style situations. Turn the lever and your vote is counted– a pellet falls into a glass cylinder. Then you can examine the cylinders to see how your vote compares to others. Be prepared for your photo op! 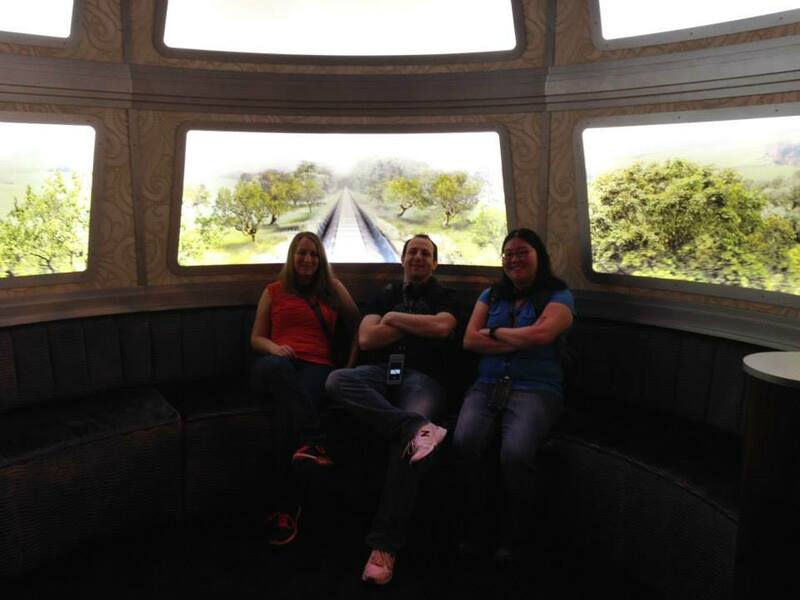 Get cozy in the back of the train to the Capitol, where Katniss and Peeta worked out their tentative friendship in Catching Fire, and snap a pic! Built-in screens give the illusion that you too are headed to the Capitol. 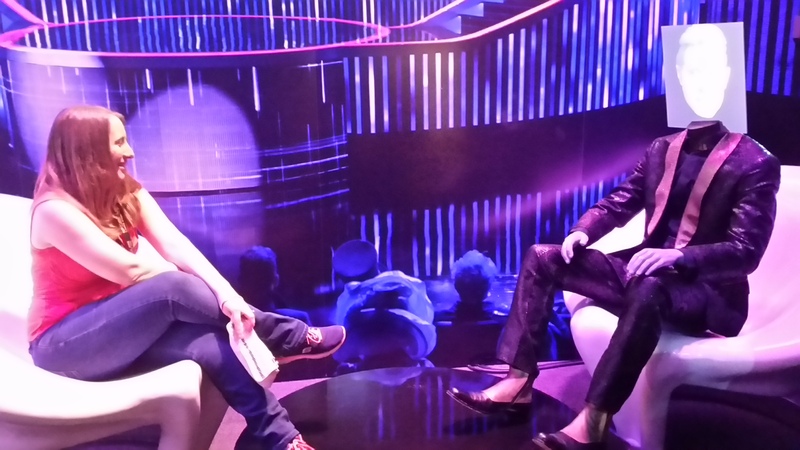 Caesar Flickerman is one hell of an interviewer, even when his head is a television screen! You can stop and have a photo op with The Capitol’s favorite television host but be warned, those fancy seats are really hard to sit upright in! Think you got the moves? A movie stunt coordinator is ready to test them! See how well you can learn and bust out a quick defensive sequence used in the films. It’s harder than you think! A special station in the Mockingjay section of the museum allows you to choose your setting and record a propo message in support of the Rebellion! Your image will then show up on the big ol’ HD TV screen behind you. At the end of the road, we hit the gift shop! 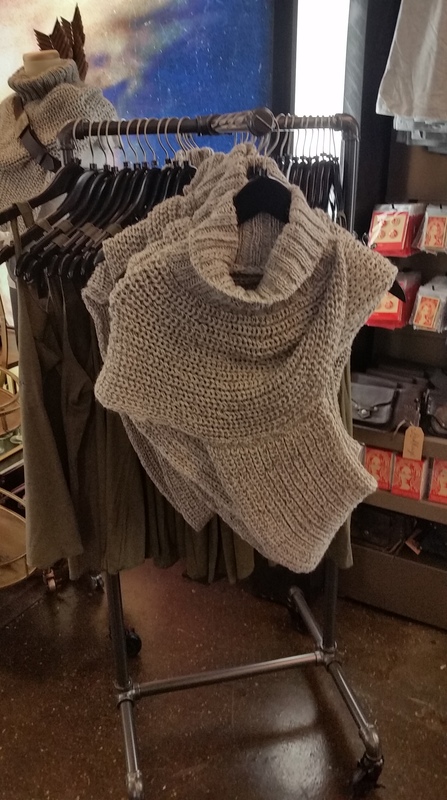 Disappointing news– the Katniss Cowl is in the gift shop, but it costs $130. Yup, the mass produced version is just as much as (if not more than) most Etsy sellers. We just want to own a Katniss Cowl and still pay off our student loan debt in a timely fashion, Lionsgate! And so ends our adventure. If you’re a Hunger Games lover and you’re heading to New York City this year, we highly recommend it! Want more images? Check out our full gallery! Soooo great thank you for sharing. That Avenue of Tributes part had me rolling!! Seeing inside the exhibition makes me even more excited to experience it myself!